WHAT’S IN A NAME FOR UNITARIANISM? The word Unitarian came into existence as early as 1568 in Transylvania (that region in Europe called today central Romania). The Protestant Reformation was about 50 years old when the word Unitarian came into being. However, the idea behind Unitarianism is much older. When first used, U. meant belief in one God rather than belief in the 3 headed God of Christianity. Because most Roman Catholics and Protestants at the time accepted the doctrine of the Trinity, Unitarians were persecuted for several centuries by both groups. Today the word Unitarian has lost its literal meaning for most of us. As historian Earl Morse Wilber explains: “The word Unitarian means freedom in religious belief and a trust that reason must guide our religious thought and action, and a conviction that tolerance, the cherishing of difference of opinion, is a good thing.” In a sense we raised up our own trinity -- freedom reason and tolerance. Where does our history begin? Unitarian thought is as old as the Bible which stretches back to 1100 BC The U. idea of God is closer to the Jewish idea of one God than the traditional Christian idea of God. Jesus, you might say, was a Unitarian in the sense he didn’t think of himself as a God or as a part of the triune Godhead. A pivotal point in our history was the Council of Nicea in 325 AD. Convened by Constantine, Roman Emperor at the time. The council was trying to decide between the Christian Arius who held a Unitarian point of view and Athanasius, who was a Trinitarian. Constantine decided the matter by ruling in favor of Trinitarians, and we have been stuck with it ever since. Another pivotal point in our history took place in 416 AD when St. Augustine had a controversy with a British monk by the name of Pelagius. St. Augustine believed that human nature was incorrigibly corrupt. Pelagius believed in freedom of human will, and denied original sin. Augustine won, we lost, and ever since Christianity has the doctrine that human nature is corrupt and dependent on God (and the Church) for salvation. A pivotal character in our Unitarian history is Michael Servetus, (1511-1553) Servetus, who published the secret of how blood circulates in the body, was our first Unitarian martyr. The Trinitarian John Calvin saw to it that Servetus was entrapped and burned at the stake for his Unitarian belief. Another pivotal character in our history was Faustus Socinus, who came to Poland, wrote a book on Jesus saying Jesus saved men not by dying for them but by setting an example for them to follow. Still another pivotal person in our history, who was also in Poland, was a court preacher by the name of Francis David At the Diet of Torda in 1568 he spoke in favor of religious toleration for all religious groups. King John Sigimund of Transylvania became a Unitarian, the first Unitarian King in all history; unfortunately he died an early death. In England the first Unitarian church was opened in London in 1774 (Essex Chapel). Attending that first service: Dr. Joseph Priestly, discoverer of oxygen and founder of the first U. church in Am. (in Phil. Pa.) Another person attending was Ben Franklin. In America in the early 1800’s we have Puritan and Pilgrim churches. In 1805 a controversy at Harvard College (who was to correctly train ministers?). A split, with the orthodox withdrawing, leaving the liberals in control. And Congregational Churches began leaving lock, stock and barrel, endowments and learned clergy in favor of Unitarianism. By 1825, 125 of the oldest Congregational churches in New England thought of themselves as Unitarian, and in the same year the American Unitarian Assoc was organized (and on the same year and day )the British Unitarian Assoc. was also organized. The oldest Unitarian Church in America is in Philadelphia, PA. established in 1796. Joseph Priestly was its first minister. Attendees included Ben Franklin, Ben Rush and Thomas Jefferson. Key names in American Unitarianism: Wm Ellery Channing, (Unitarian Christianity) Ralph Waldo Emerson (Transcendentalism), Thoreau, Tom Jefferson, John Adams, Longfellow, Lowell, O.W. Holmes. The same forces that brought Unitarianism into being ,also brought the United States and its democracy into existence. WHAT’S IN A NAME FOR UNIVERSALISM? Universalism as a philosophy goes back to the Ionians of the 5th century, who had the notion there must be a common denominator, a red thread, in all natural phenomena. In early Christianity, Paul and Jesus held the idea of Universal Salvation for all people. But Universalism really took on distinctiveness as a church in 1770 when John Murray came from England and landed at a place called Good Luck NJ. He left the old world grieving the death of his wife, disturbed by the harsh Calvinism which asserted only the elect would be saved in the heavenly hereafter. When his ship stuck on a sand bar, he went ashore for food, met Thomas Potter who providentially had built a church near his home hoping someone would preach there a Universalist message of salvation for all. This was Murray Grove. By 1779 Murray became the pastor of the Independent. Church of Christ of Gloucester MA, the first organized Univ. Church in the New World. Universalists were persecuted in the New World. The U. meeting place was seized for nonpayment of taxes; it took 3 years to recover it. The verdict freed Universalism from obligatory financial support to the state Calvinistic church. Hosea Ballou came after Murray to give us a statement of classic Universalism; his Treatise on Atonement, rejected Calvinistic theories of depravity, the Trinity, endless punishment in hell, asserting a God who created all persons worthy of love, and potentially good. This was a frame for our faith. Universalism started out in this country persecuted and poor, eventually becoming patron of such schools as Tufts, Lombard, St. Lawrence, Akron U. Goddard, Clinton. Home clergy. Some Universalist names: Ben Rush, forming first non sectarian Sun. School in Am, signed Declaration of Independence. Rev. Charles Leonard, founded Children’s Day. Olympia Brown, first woman minister in Am. Clara Barton, founder Am Red Cross. Starr King who kept state of CA in Union during Civil War. In our time: Ken Patton, Clint Scott. 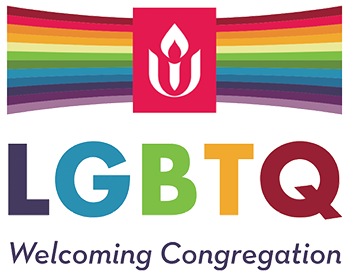 Unitarians and Universalists found they had enough in common that they merged together in 1961 to become the Unitarian Universalist Church of America. Both had been denied membership in the National Council of Churhces for Christ. Both believed the personal quest after truth should not require subscribing to certain creedal tests. What is easy about developing and trusting one’s own mind and conscience as final authority? What is easy about accepting the responsibilities of freedom in a world that is so full of benevolent tyrants and powerful institution ready to do our thinking for us. It takes a kind of tenacity, a kind of courage, as well as effort, to keep independent and alive. It isn’t easy! It costs -- and sometimes it’s a risk and sometimes it’s a hardship to be identified with something regarded as different. It would be easier to stay in the great comfortable middle. Many of us prefer to be the leavening in the loaf, not the whole loaf. And we know that in freedom our struggles stretch us as kites rise against, not with the wind.